Tunnels and Trolls Solo Adventure. Times are hard in the small mining town of Rosil. The mine workings grind and heave no more, and the iron mine trolleys stand motionless on the rusting tracks that lead into the gloomy tunnels. 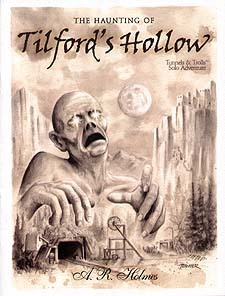 Yet one mine may still contain precious silver ore. Tilford's Hollow stands in the shunned Dark Water Crag, an abandoned quarry. Rumour is that the mine is haunted,and anyone entering risks death and madness. However, could it really be that bad? Surely it is worth the risk if there is wealth to be had in the old mine workings? If the mine could be reopened, maybe Rosil will once more prosper.